I like to read. I read all the time. I’d rather read than do laundry. I’d rather read than go to the dentist or get a pap smear. I’d rather read than give birth. So on occasion in this blog I will share the book I’m reading and give it a review. 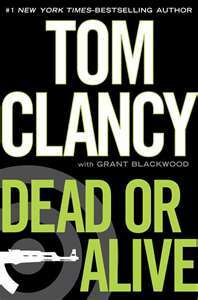 This past week I finished Tom Clancy’s new novel “Dead or Alive.” It weighs approximately 45 pounds and comes with its own shoulder harness to protect the lower back. I’ve always loved reading Clancy’s books. I love the idea that someone in the government has our backs–because I’m pretty sure that’s fiction. I like that the good guys win–even if sometimes bad things happen. “Dead or Alive” was boring. There wasn’t that hanging-on-the-edge-of-my-seat suspense that Clancy writes so well. I thought the writing was choppy, the story was bland and the characters were flat–except for the women, who always seem to have large chests. I trudged through 900 pages hoping it would get better–but it never did. Give me “Hunt for Red October” or “Clear and Present Danger” and I’ll be in espionage heaven. But this one didn’t work. Too bad. But I’m not giving up on Clancy yet, maybe next time he’ll be back better than ever. There’s my inexpert opinion. Let me know what you’re reading. I’m always looking for something new!